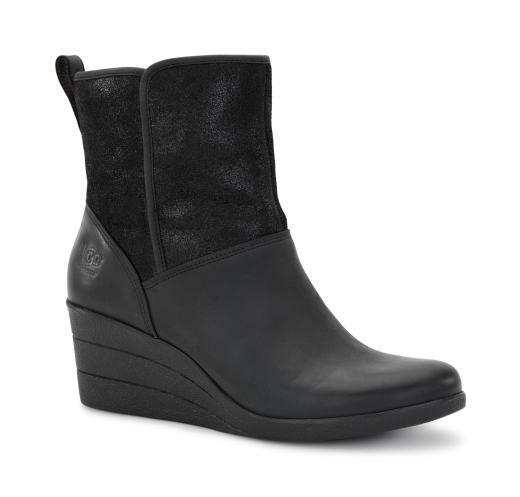 From the Uptown Wedge Collection by UGG Australia the Renatta is a waterproof leather ankle boot in a bomber jacket inspired material selection with a decorative leather strap secured by a metal post. Medial zipper fo easier entry. Based on a 2 1/2" decorative molded spider rubber wedge outsole, with integrated steel shank, for added comfort and traction in the rain. Seam sealed construction and waterproof materials make this boot ideal for the rain without losing that street chic look.